We had a ball today! 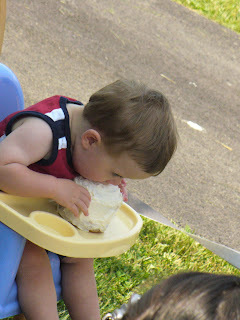 It was Grant's first birthday party and what fun we had! Last night, Chris' parents, my sister and brother-in-law, and Chris and I, were up until nearly 2 am working on Grant's birthday cakes. I had originally made a chocolate one and a vanilla one. While they were cooling, we let Grant open up the present that Aunt Stephanie and Uncle Dan had gotten for him. It was an adorable Pirate puppet. Grant loved it! He talked to it, played with it, giggled, and just had a ball. After we had watched him playing with it for a while, suddenly, I heard a slurp. I ran into the kitchen to find that Emma Lou had eaten the entire white cake. She was sitting on the floor looking completely innocent while licking her chops. I could have killed that animal. So back to square one. Now we were having 2 chocolate cakes because I didn't want to go back out to the store for another cake mix. 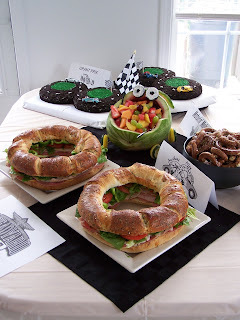 We were having a racing themed party, so our job was to create cakes that looked like race tracks. We used icing, oreos, green sugar and little toy cars. It took forever! Chris and Dan made little checkered flags, and then we got really creative. I was having sandwiches in the shape of a circle which we titled, "Breadyard 400." The cakes were titled, "Grant Prix." The pretzels were titled "Accident Alley" and the fruit was made out of a watermelon that we carved to look like a car. We titled it "Motorin' Melon." And then of course we had the "Pit Stop" where people could get their drinks. And everything had a sign telling what it was. They boys worked so hard on those signs. They looked great. Everything was so cute. I was proud of it. We had about 30 people come. They brought gifts to Grant to our surprise and he has had so much fun playing with his new toys, wearing his new clothes, etc. 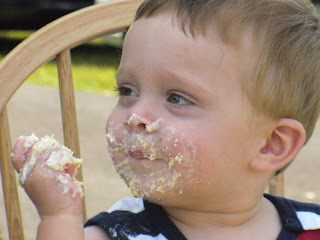 We watched Grant eat his cake. At first he just licked the icing off his fingers. 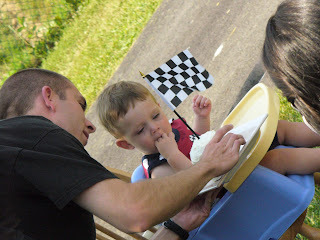 Then it didn't take long and he went head first into his little miniature cake with a checkered flag on top. He loved it! I think he would have eaten the whole thing had his daddy not taken it away about 1/2 way through. He was so cute. It was a fun day.